Voice is produced when air from the lungs passes through the vocal folds (vocal cords) in the larynx (voice box) causing the vocal folds to vibrate. This vibration produces a sound that is then modified and shaped by the vocal tract (throat, mouth and nasal passages). A voice problem or disorder can be caused by a problem in any part, or combination of parts, of this system. For more information on how the voice works, see this tutorial on the University of Minnesota Lions Voice Clinic's website. A voice evaluation includes taking a detailed history of the problem, collecting acoustic and aerodynamic measures, and looking at vocal fold function using laryngeal videostroboscopy (a scope that goes in the mouth and looks down at the vocal folds). This information allows us to determine what is causing the voice problem and recommend appropriate treatment. It is usually necessary to see an otolaryngologist (ear, nose, and throat doctor) to determine any medical causes of the voice problem. 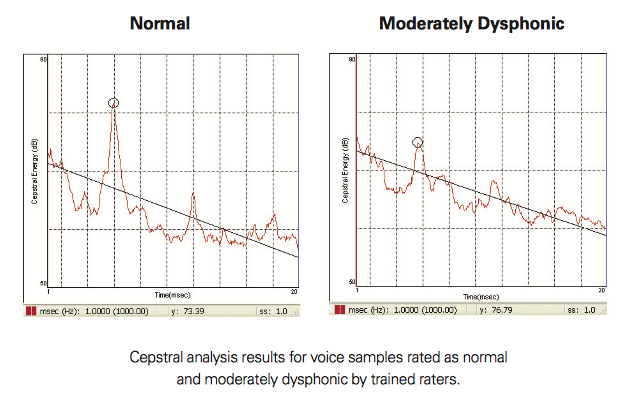 For more information about voice evaluations, go to the Voice Evaluation page. Voice therapy can be very effective in reducing or eliminating a voice disorder, depending on the cause of the voice disorder. Voice therapy often includes improving vocal hygiene (adequate hydration, reducing misuse/overuse, etc.) as well as direct therapy methods aimed at changing inefficient and/or inappropriate vocal patterns. For example, muscle tension frequently causes a person to use too much effort when speaking. Teaching a person to produce voice without excessive tension can reduce or eliminate vocal fatigue, hoarseness, breathiness, and vocal nodules along with other symptoms. Sometimes concurrent medical treatment is also necessary, or medical care alone may be the most appropriate treatment. For more information about voice therapy, go to the Voice Therapy page.